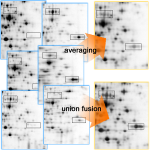 Delta2D's image fusion lets you create proteome maps from collections of 2D gel images. A proteome map looks like a real gel image but combines all spots into a single image – even those that will never be expressed simultaneously. You can collect protein identifications on the map and use Delta2D to transfer them automatically and reliably from and to other gels. Delta2D allows you to place labels anywhere on a gel image – independently from spot locations. Managing master gels with spot identifications is easy – a single click will transfer labels from one gel to another. You can change label colors and formats according to your preferences. Just like any other data generated by Delta2D, label data is saved in XML files that can easily be processed by other applications. Delta2D's proprietary image fusion lets you create proteome maps from collections of 2D gel images. The respective images need to be aligned by image warping, another technology inside Delta2D. 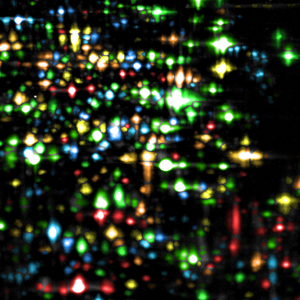 A proteome map looks like a real gel but shows all spots on a single image - even those that will never be expressed at the same time. You can collect protein identifications on the map and then use Delta2D to automatically and reliably transfer them to new gels. Gel images can also be merged into an average image which combines replicates pixel-by-pixel. The larger an experimental design, the higher the analytical complexity. Spot color coding condenses whole experiment expression profiles by using different colors in just one gel image, typically the Proteome Map of your experiment since it includes the complete spot pattern.